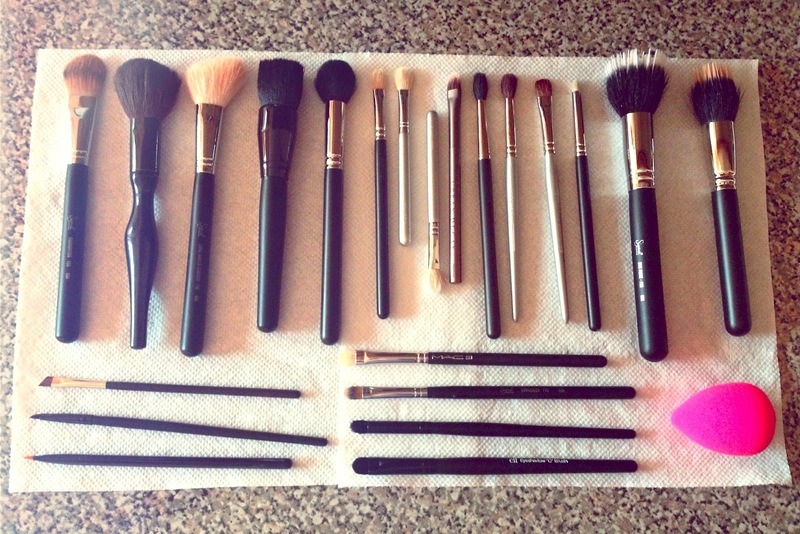 How do you clean your makeup brushes? And how often? If you have sensitive and/or acne-prone skin, you must, repeat: MUST! 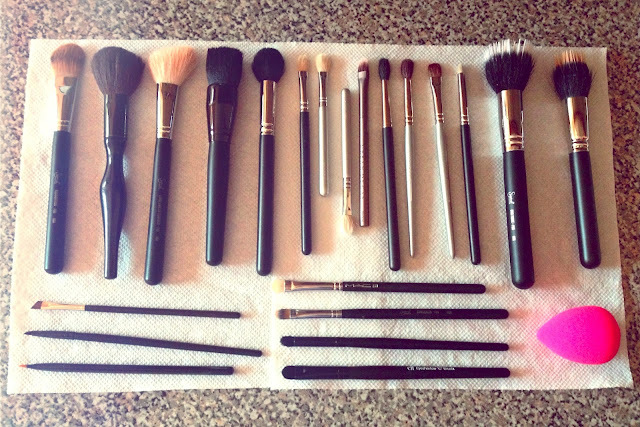 :) keep your face brushes squeaky clean :) Makeup brushes can harbor so many gross bacteria especially those used with liquid products like foundation. So I tend to wash my foundation brush, my pink sponge, and my powder brush every time before I use them. Since I don't wear foundation on a daily basis however, the times I wash them varies, but I just make sure their clean before they touch my face! :) If you have normal skin, I'd suggest washing them once a week. I've tried DIY brush cleaners but never felt they did a superb job, and since I spend a lot on brushes I wanted to invest in a good cleanser to keep them fresh and clean. These are the three I've used in the past and really love! This is a great brush cleanser and does the job well! It comes in a small travel size (2 oz) so it's great for traveling. On the other hand, I recently discovered the MAC cleanser which costs less money, and has more product, so I switched over to that one. This is obviously a bargain for $3, but unfortunately I am not a huge fan because it leaves my brushes very dry. I do however use this to clean my eye makeup brushes from time to time, and it does a great job. I recommend this one for someone just getting into makeup and experiment with different brushes and products. I keep one of these as a backup whenever I run out of my MAC one. 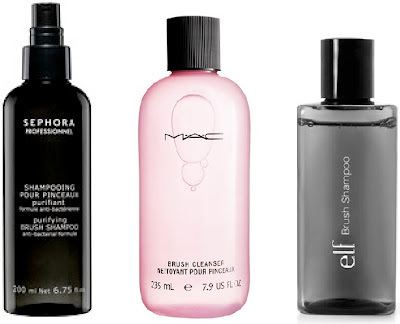 How about DIY brush cleanser or baby shampoo? Using baby shampoo is great for eye makeup brushes, but for the skin it's important to use something with an anti-bacterial formula to kill the germs that accumulate on the brushes. I've tried Michelle Phan's DIY brush cleanser which consists of anti bacterial dishwashing liquid (to remove bacteria and grease) and olive oil (to soften), but my brushes were either too dry or too oily, so wasn't a big fan. I also recently heard about EnKore's brush cleaning recipe and have read mixed reviews, but it's worth a shot if you want to save a few extra dollars in the long run. You can find his recipe here. Overall, I like to stick to the three cleansers above! I think they do a great job and are worth investing in if you have acne-prone skin like I do and want to make sure you're brushes get a nice clean. Hi Annie...I´m a huge fan of your blog! Thanks for the tips! MAC Brush Cleanser is a wonderful product! Definitely my favorite as well. It seems we had the same idea here ha! I actually use MP's recipe and it works! Just 1/ 4of oil approx and a dishwasher that removes the grease. I want to know tooo, which ones are the best..